Blend the butter and sugar in a bowl. Add a whole egg and mix with a fork. Pour in the flour, baking powder and mix the dough with your hands until it is firm and soft. Line a 'crostata' pan with parchment paper and roll out the dough (do not let it rest in the refrigerator). Then grind up the Ricciarelli and spread the mixture on the dough. Peel and slice the apples, placing the slices on the Ricciarelli-covered dough. Cover with a lid of dough and bake at 180°C for 30 minutes. When the crostata has cooled, dust with icing sugar and serve. You can make the same pie using pears or peaches, too. Enjoy it with a cup of hot tea. 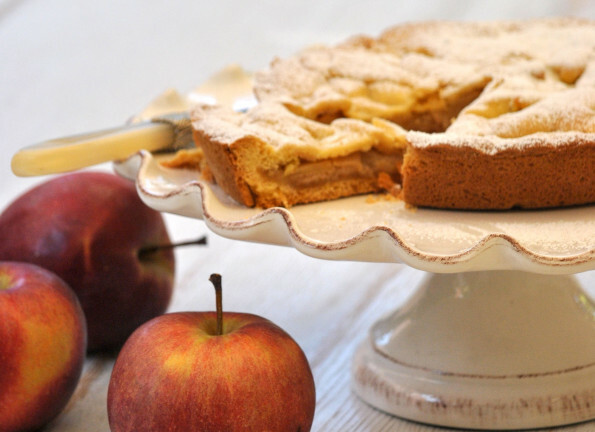 This is somehow a modern version of the famous, classic apple pie. The crumbled Ricciarelli biscuits at its base give it a delicious almond flavour and a different, captivating texture. Ideal at breakfast time, as a dessert or at tea time, this 'crostata' will satisfy your sweet tooth with its natural delights!